The “Memory Palace,” a form of the method of loci, is a technique by which the user memorizes a physical space (often, a palace), then– when desiring to remember something– walks to a location and “deposits” that memory… which can be retrieved simply be “revisiting” that location. It dates back to ancient Greek and Roman rhetoricians, and, as Frances Yates explains in The Art of Memory, was in broad use all the way until the Enlightenment. 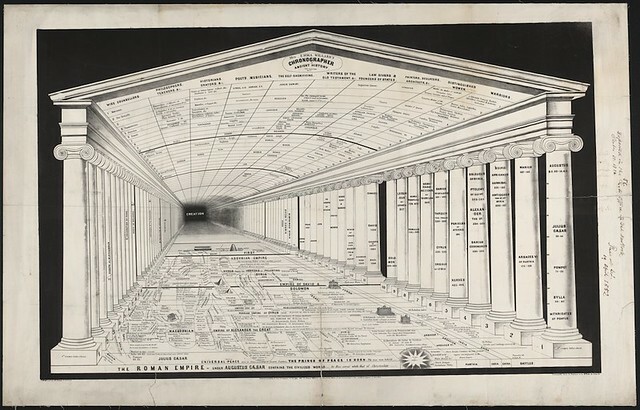 More at “A 19th-Century Memory Palace Containing All of Ancient History“: and see a zoomable version of the Temple here or at the Library of Congress. 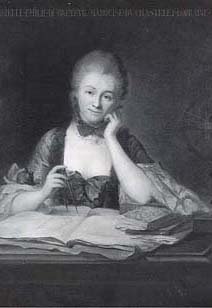 As we tidy up, we might send carefully-calculated birthday greetings to Gabrielle-Émilie Le Tonnelier de Breteuil, Marquise du Châtelet, the French mathematician and physicist who is probably better known as Voltaire’s mistress; she was born on this date in 1706. Fascinated by the work of Newton and Leibniz, she dressed as a man to frequent the cafes where the scientific discussions of the time were held. Her major work was a translation of Newton’s Principia, for which Voltaire wrote the preface; it was published a decade after her death, and was for many years the only translation of the Principia into French.